Thoroughly enjoyed our stay. Beds were very comfortable indeed. Pluguffan a five minute drive away provided a very adequate food store. Stunning beaches at Benodet and Ile Tudy and coastline within easy reach, great for walking, we only wish we had more time to walk and explore and good shopping experiences in Port L'Abbe and Quimper. We enjoyed having the different areas to sit in outside the cottage and enjoy the sun. Also the company of Reglisse! The cottage could benefit from a second toilet but this was not a problem. We definitely will be coming back. We've just got back from a lovely week in the Brittany countryside. I went with my wife and daughter and the pace was delightful! We drove to a different beach most days and cooked at home most evenings and the hosts couldn't have been more helpful. Thanks. This is not a luxury cottage in fact it is a bit rough round the edges. BUT it made a great holiday with children. At this price you do not expect a private heated pool this big. There is plenty of space outside and in. Kitchen is equipped for any needs. Games and books provided. WiFi can deliver online TV. Beds comfortable. Most of all however Olivier and Elodie are great hosts never interfering but helpful and warm when needed. Tony, thanks a lot for your comment. We had a wonderful holiday break at Pluguffan. The gite was great; comfortable (cool inside in the very hot weather) and generally well equipped. The private pool was a lovely extra. South Finistère was beautiful with plenty to see from pretty costal towns, medieval Quimper, fabulous beaches and some great surf for teenagers and costal walks. 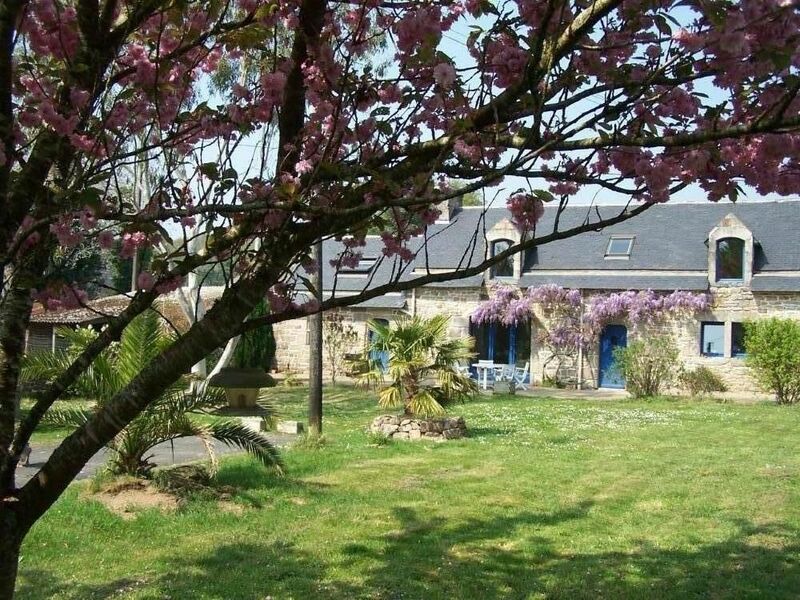 We enjoyed the many festivals that occurred whilst we were there and would have visited more sights if we hadn’t been distracted by the tranquility of the gite!! Elodie and Olivier were perfect hosts - thank you for all your advice on things to see and do and for the delicious welcome pack that greeted us on our arrival. Our 2 teenagers loved the kitten, all your livestock and the deer we saw roaming the fields at dusk. We have just returned home from a fabulous fortnights holiday at Kersanteg near Pluguffan. The property was very comfortable and tastefully decorated with everything we needed to relax. Our 6 year old twins happily shared one of the double beds upstairs but would ideally of preferred single beds in the same room but this was not a problem. The stylish swimming pool with large deck area was enjoyed by us all and the girls swam every day. They were thrilled to play with the owners pet goat and sheep that live in the pretty grounds of the property. Exploring the local area was a joy. We visited Quimper, Pont Aven, Audierne and the market at Pont-l'Abbe as well as enjoying many of the stunning golden beaches. The local citron crepes were exceptionally tasty too! We had a wonderful holiday! Many thanks to Elodie and Olivier for the super welcome pack and extra little details that made our stay so special. The Arding Family, Wiltshire, England. Terraced house with the owners (young couple to welcome and advise you if required, on how to better organize your stay). If you wish to have a drink or find a good bottle of drink, we can provide you with our best addresses.